You’ve hit the nail on the head – there’s simply too much bias. Something even the most highly trained academics, including people who work in the therapy industry are guilty of. Thank you for your nuanced response, it was much needed! The study, by a German University, was highly published and promoted since 2017, proclaiming in big titles “The Ancient Egyptians were more European than Subsaharan African”. I thought it was shockingly disturbing that even from the title you could discern an inherent racist bias, and most importantly that reputable news outlets would assert such strong conclusions when the study was so poor and limited. In fact, it included 90 mummies, with solely 3 complete genomes from the same exact site in Northern Egypt, but also the period of time studied was that from the New Kingdom-the later period of Kemet, which follows migrations and major invasions notably by the Hyksos- and stretches far into the Greek/ Roman rule. Although I know this will trigger people, and I will probably be accused of being another crazy counter-establishment revisionist, but for me extrapolating small, pre-selected results to pursue the same agenda Egyptology and Eugenics have pursued for almost 200 years, namely to assert European superiority, I think is racist. I don’t think it has been said enough. I don’t think people are aware of this, especially in the United States and in the Magreb. This a hard fight, it is political, it is emotional, and obviously, we must leave biases as much as possible out of the question when studying this topic. 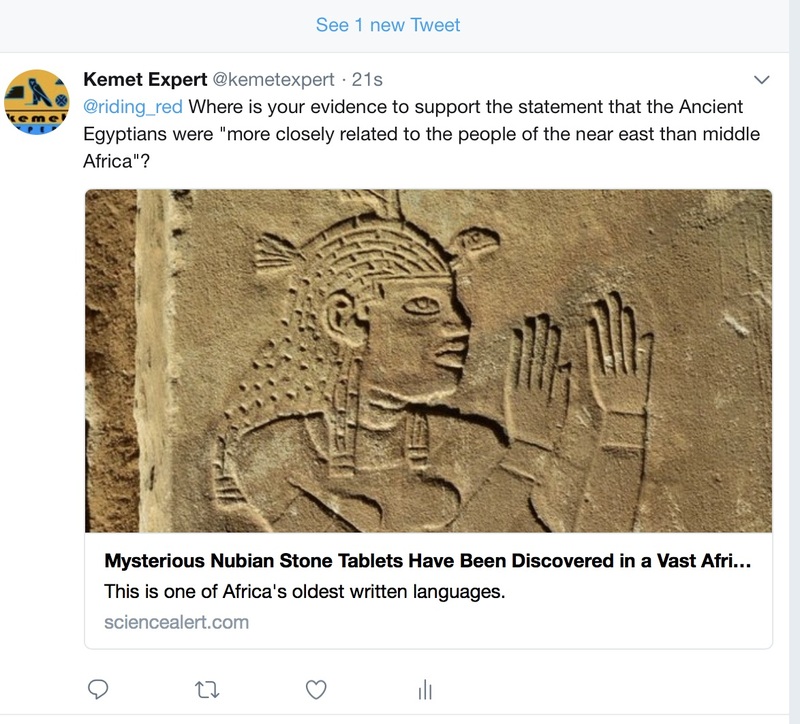 But I just want to say, author of this website, if you are trying to shed more light on Kemet, even against establishment narratives, you are fighting against dragons, and they have money. Make sure you build allies! Hi. Hope all is well. When will we see new post from you on this site? You and your expertise are truly missed. Thank you for sharing truth. Why do the so call contemporaneous western scientist of Egyptology beating around the Bush always by saying that ancient Egypt is a Caucasians or middle eastern civilization, while its very clear that it had originated first in Upper Nile Region(Sudan & South Sudan) before it reached its zenith at the Nile Delta, before Hykos came into kemet by Thousands years? When addressing this kind of work one has to use both data, critical evaluation of methodology and the philosophy science which refer back to the former. One must ask have the authors excluded any information that would counter their conclusions? Are there alternative explanations for their findings that should be presented? Good work requires the consideration of multiple explanations. Does the work expose a particular school of thought or interpretation, old paradigms, or pieces of such? Are things implied if not explicitly stated that could be or are misleading? Have the authors by implication simplified a complex situation? Have they used total evidence? I stumbled upon this blog. You have some amazing work here. My tribe (Nyanja) from central Africa has many oral historical recollections of their origins from North Africa. I have always wondered whether the religious practices have any connection to Egyptian ancient practices. The masked dancers and secret society of the Chewa bear a resemblance to some ancient Egyptian gods…any thoughts? @Saart. Ths question was not about the origins of the language but rather of which language family it was most closely aligned to. I am already familiar with its Wolof parallels, but then again, the question is of language family, whereas the latter is of the so-called Niger Congo, when I specifically bisected Afro-Asiatic and Nilo-Saharan for effect. I still dont see why people keep asking where the language comes from There are no pyramids or buildings anyone in ” The Levant ” with Egyptian Hieroglyphics, yet there are peoples in Africa with languages that are eerily similar to Ancient Egyptian, for example. Why would Black West Africans language be this Similar? The Pyramids, found in Zinder, Niger are also another dead give away, plus the Ruins in South Africa, that have Pyramids engraved on the stones. Excellent observations, Sartt. I will certainly look into your references. Thank you. Please also look at Asar Imhotep’s plublications and presentations he strictly uses the historical comparative linguistic method African linguist’s concluded the Mdw Ntr to be part of the Ntu language family. Modern research has done such a great job of illuminating the African roots of this ancient culture that all other assumptions seem antiquated; but sadly many continue to cling on to the Eurasian migrant theory until the bitter end. I believe that much more could be glossed from the history if observers would just simply open their minds, for there is much more to know and appreciate about the culture that is ancient KMT. The linguistic roots of KMT is a dead giveaway, and it is hardly discussed by most modern scholars. My question is, does the language of ancient KMT share more affinities to the Nilo-Saharan family than the Afro-Asiatic, which would place it more in line with the Sudanic and Nubian languages? Its relations to Semetic and the Near-Eastern languages has already been defeated on all grounds. Thank you. Afro-Asiatic languages is a faulty classification and based on opinion the historical comparative method was not employed by Greenberg in order achieve this classification which is like doing genetics without the science of dna and allows for bias. Thank you sally for challenging these misleading lies and is hard for a white woman as yourself being an advocate for a black egypt. Are you perceived differently by other egyptologist? Egyptologists often disagree with interpretations of materials. I am different to many Egyptologists in my training because I have a background in both Classical languages and archaeology as well as those related to Egypt. The last 7 years of my career as a professional Egyptologist were also spent researching other African cultures. My question is why would this individual even need to bring that up? It seems to me that there is almost this obsession in the field of pop science to push Ancient Egypt as non-African. They’re the ones that keep telling us that “race doesn’t matter” and all of that yet they seem pretty intent on trying to prove that the Ancient Egyptians weren’t African (despite the fact that Ancient Kemet was, yes, in Africa). Hello Sally, I recently stumbled upon your website and rediscovered your passion and steadfastness for the truth as it pertains to the peopling of Kemet. We met in Manchester in 2009 at the “Egypt in its African Context” conference where I presented my paper “Unwrapping Egyptology” which also appears in my book The Battle for Kemet. I believe I may have given you a copy. I commended you then for the work you were doing on Kemet and the work you were engaged in with the incarcerated. As you may recall Frank Yurco (Egyptologist at the Field Museum and Oriental Institute at the University of Chicago) who was the subject of my paper “Unwrapping Egyptology” had unfortunately made his transition in 2004. However, the fact remains that Frank admitted in 1999 that the depiction of ancient Egyptians as painted on a wall in the tomb of Ramesses III showing them with the same black skin color and dress as the Kushites was a valid representation of how they (the Kemites) saw themselves. While this alone won’t be enough to sway some naysayers it could at least provide food for thought and add to the arsenal of facts considering that Frank was far from being African centered. Looking forward to reading more on this site. Hi Charles, yes of course I remember. In fact I have shown your book to a number of people over the years, as well as using it myself. Thank you for sharing this fact. It’s great to hear from you.